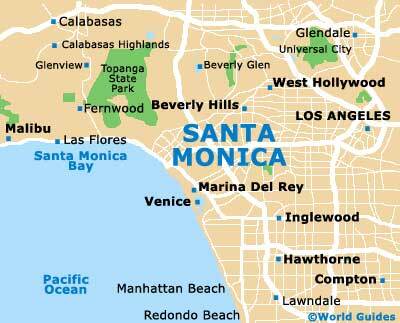 The carnival-like resort of Santa Monica offers visitors an abundance of fun activities and top tourist attractions, to make holidays in this beachfront city both exciting and memorable. While Santa Monica Beach is one of the main draw cards, offering water sports, people watching and plenty of opportunity for bathing, a whole host of other sights combine to make this one of LA's most popular beachside locations. 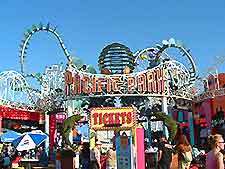 Families will love the area's premier attractions of Santa Monica Pier Aquarium and the pier itself, where fishy friends and thrilling rides reside respectively. Tourists who wish to indulge in shopping and dining should head straight for the Third Street Promenade, where you will find lively entertainment and an electric atmosphere. 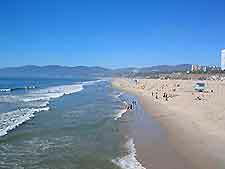 The main attraction of Santa Monica has got to be its beautiful sandy beach, offering endless opportunities for bathing in the cool Pacific waters. 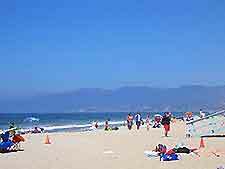 While it is one of the most crowded beaches in California during the summer months, its popularity is seen as a positive thing by many, allowing for some of the best people watching on this stretch of the coast. In winter, Santa Monica Beach is unrecognizable without the sea of bodies that it welcomes in peak months, and it is during these cooler months when the beach becomes the perfect place for early morning walks. An iconic feature of this Californian beach paradise is the Santa Monica Pier, which is colorfully illuminated at night. If the dazzling Ferris wheel and roller coasters aren't enough to attract you, then maybe the candy floss will. The pier offers a quintessential seaside experience not to be missed. For spectacular views of the coastline and beachfront, take a ride on the world's first solar powered Ferris wheel, which stands at 130-feet / 40-meters high. Boasting several themed tanks full of creatures from the deep, the Santa Monica Pier Aquarium (formerly named the UCLA Ocean Discovery Center) offers both an educational and interesting experience, and a chance to get up close with some of the ocean's secrets. The shark and ray tank is particularly popular, while additional attractions include touch-tanks, allowing visitors the chance to feel sea cucumbers and other bizarre invertebrates. Children can make use of the kid's art area, which features a host of fishy activities. Showcasing mystery, magic and illusion, Magicopolis will take you on an exciting adventure into the impossible. Be prepared to witness mind-boggling feats, disappearances and escapes that will loosen your grip on reality. This is a fantastic family attraction that will leave you breathless and wanting more. Located just off the Pacific Coast Highway and offering stunning ocean views, this park allows visitors to enjoy the coast from a different perspective. With eucalyptus-lined paths peppered with seating areas running along the coast, the Palisades Park is perfect for strolling and taking in local nature and wildlife. The park features the Veterans Memorial, a structure dedicated to members of the armed forces who have lost their lives in conflict.